any day now. SweetWater is the latest brewery to make it onto the Louisiana craft beer scene, and last week we reviewed the SweetWater Blue. Since then I had the opportunity to serve some beer at the Ultimate Tailgate benefit party in Covington. The beer cart that Mandi and I were working was loaded with a lot of BMC, but also a good bit of the highly anticipate SweetWater beers. I'm happy to say that the SweetWater was moving just as fast as any of the BMC products! 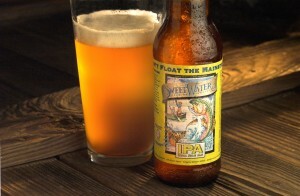 This week, we have the SweetWater IPA, their take on a standard American IPA style. Here's what they have to say, "This mammouth India Pale Ale is loaded with intense hop character and subjected to an extensive dry-hopping process. Our IPA is unfiltered and as always, not pasteurized, leaving all the natural flavors intact. The Beer You’ve Been Training For." Reviewers: Eric Ducote (BR Beer Scene), Jay Ducote (Bite And Booze), Brenton Day (The Ale Runner), Chuck Pierce (Me And My Big Mouth), and Kevin Cowan. Appearance: On the border between gold and amber, with a little haze. Aroma:Hoppy, but I found it to be a little mild. Jay picked up some piney notes and Brenton also noted that it had some grapefruit aroma. Taste: Brenton described it as, "citrus & hop flavor with little bitterness." I think he means that as a good thing, and I definitely thought the flavor was better than the aroma. Mouthfeel: Easy drinking, a lot of hop flavor but not off-puttingly bitter. Overall: We had a lot of variation in the scores on this one... as low as a 38 and as high as an 85. I had it in the middle, and I think it's really a middle of the road IPA. Brenton loved it, saying that it's "so drinkable for the amount of hop aroma and flavor." I'd certainly try some more.